When my Email Message is ready to go. How can I Send a single GroupMail email to myself? Once you have completed your GroupMail Message, it’s always a good idea to send one to yourself just to make sure you are a 100% satisfied with how it displays. To Send a Single Message, on the GroupMail Message Editor, Click on the Preview Tab at the bottom of your screen. 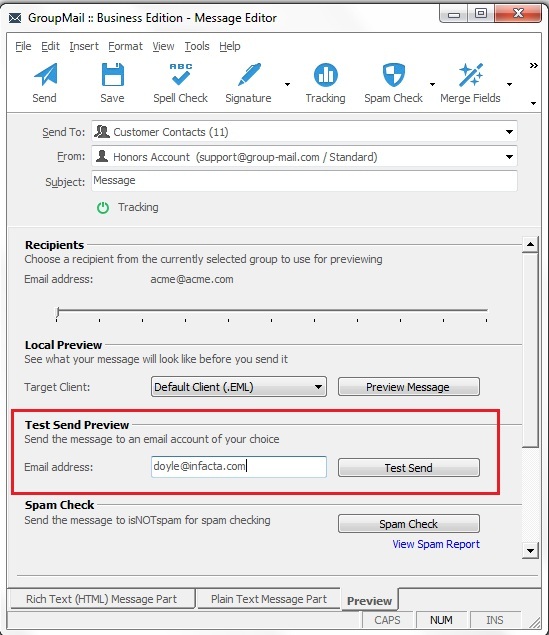 Enter the Email Address that you want to send this Message to in the “Test Send Preview” Field and press the “Test Send” Button. A single message will be sent to this email address so that you can check it appearance before sending to your entire Group.